Pittsburgh was granted a franchise by the National Hockey League on November 7, 1925. 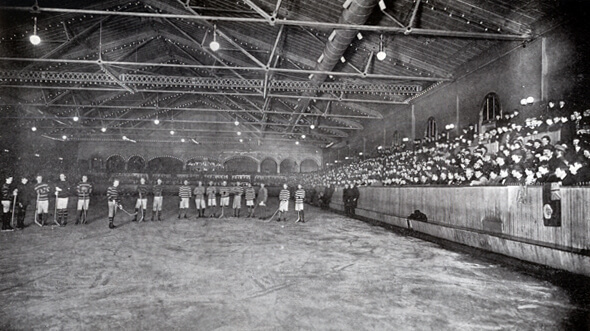 The move came after Eddie Livingstone, the former owner of the Toronto Shamrocks and the Toronto Blueshirts of the National Hockey Association saw Pittsburgh as a possible member for a proposed rival league to the NHL; Pittsburgh had, in the 1890s, been the first metropolitan area to professionalize the game of ice hockey. In order to thwart the new league, the President of the NHL, Frank Calder, negotiated to put a franchise in Pittsburgh, which become the seventh team to join the NHL as well as the league’s third US-based team. Callahan then renamed his team the Pittsburgh Pirates, after he received permission from Barney Dreyfuss, the owner of the Pittsburgh Pirates baseball team. The Pirates were assigned to what would later be called the NHL’s American Division, with the Boston Bruins and the New York Americans. These two franchises were the only other American teams in the NHL at the time. The Duquesne Gardens, located in the city’s Oakland neighborhood, served as the team’s home arena. The Pirates, dubbed the “Mighty Steel City Sextet” in the Pittsburgh Press, were mostly leftovers from the former Pittsburgh Yellow Jackets. Ten former Yellow Jacket players would play for the Pirates. In 1928, financial problems forced James Callahan to sell the team to an ownership group which included Bill Dwyer, an early Prohibition gangster and bootlegger, and Benny Leonard, a fight promoter and ex-lightweight boxing champion, as his front man. Despite the sale of the team, things didn’t improve on the ice for the Pirates. The team’s coach, Odie Cleghorn left the team at the end of the 1928 – 1929 season to become a referee. Frank Fredrickson was then named the team’s coach. Another major change came with the team’s uniforms, as the Pirates’ color scheme changed to black and orange. 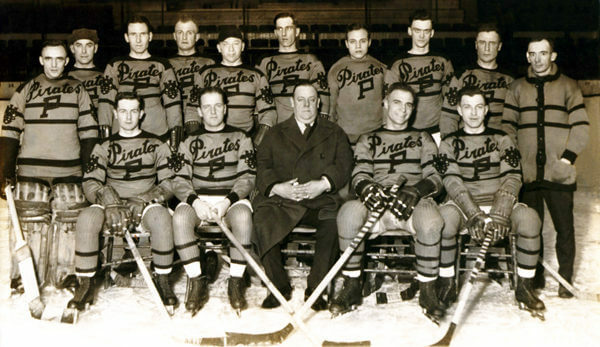 The Pirates 1929 – 1930 season was their fifth season in the NHL, and what would eventually be their last. The season saw the Pirates achieve their worst win-loss record with 5-36-3 record. With the stock market crash of 1929, followed by the Great Depression, the owners found themselves in financial difficulties. Attendance for games was down and the owners tried selling off their star players in order to make ends meet. The team was $400,000 in debt by the end of their final season and in need of a replacement for the aging Duquesne Gardens. On October 18, 1930, at the NHL Board of Governors meeting, Leonard moved the team across Pennsylvania, to Philadelphia, and renamed them the Philadelphia Quakers. However, Leonard’s intention was to return the team to Pittsburgh as soon as a new arena was built. Thirteen players from the Pirates were transferred to the Philadelphia Quakers after Pittsburgh franchise relocated. These players were Cliff Barton, Harold Darragh, Herb Drury, Gord Frasier, Jim Jarvis, Gerry Lowrey, Rennison Manners, Johnny McKinnon, Hib Milks, Joe Miller, Rodger Smith, and Tex White. Frank Fredrickson was also transferred to the Quakers, but he was released by Philadelphia two days later. The Quakers posted a poor 4–36–4 record in 1930 – 1931. The team then received permission from the NHL on September 26, 1931, to temporally cease operations as they sought a new permanent arena, located in either Pittsburgh or Philadelphia. Meanwhile, the poor economy was taking a toll on the entire league. The Great Depression devastated the NHL as four teams were forced to fold, leaving behind just six teams. When a new Pittsburgh arena failed to materialize, Leonard surrendered his franchise in 1936. As it turned out, a new arena in Pittsburgh wouldn’t be built until the Pittsburgh Civic Arena opened in 1961. The NHL would play with six teams for 25 years before deciding to expand. The expansion in 1967 brought the Pittsburgh Penguins to the NHL and the city of Pittsburgh and the orange and black uniformed Philadelphia Flyers to Philadelphia. The last active Pirates player was Cliff Barton, who played his last NHL game in 1940. The Pittsburgh Pirates were an American professional ice hockey team in the National Hockey League (NHL), based in Pittsburgh, Pennsylvania, from 1925 – 1926 to 1929 – 1930. The nickname comes from the baseball team also based in the city. For the 1930 – 1931 season, the team moved to Philadelphia, Pennsylvania, and played one season as the Philadelphia Quakers. Pirates – Owner Callahan renamed his team the Pittsburgh Pirates, after he received permission from Barney Dreyfuss, the owner of the Pittsburgh Pirates baseball team. The Pittsburgh Pirates were an American professional ice hockey team in the National Hockey League (NHL), based in Pittsburgh, Pennsylvania.